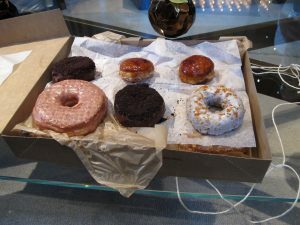 We used to get Doughnut Plant doughnuts at Joe Coffee in the West Village, but unfortunately they stopped carrying them. So, we had to search out the actual Doughnut Plant storefront on our next trip to NYC. Luckily, there are two locations for the Doughnut Plant, so as long as you’re below Central Park, you’re in. These doughnuts are freakin’ great. Our favorite has always been the Peanut Butter with jelly filling, but this time we’ve discovered a whole batch of new flavors. Some of our top favorites were creme brulee, coconut with coconut cream, glazed, vanilla bean and strawberry. Most of their filled doughnuts are square, while their others are the typical round. The smallest is the creme brulee doughnut, but it packs a punch for its size. This is a “must stop” if you’re a pastry fan. Whether you like raised or cake donuts, they have a myriad of each and you won’t be disappointed. Doughnuts here aren’t just for breakfast. Standard hours at the Doughnut Plant are 6:30AM to 6PM 7 days a week. Check before you go, however, just in case hours have changed.